Despite the muddled political scene, street violence, and general unpredictability facing Egypt, most still see the upcoming presidential elections as the lynchpin of the nation’s democratic transition. As such, there is anticipation and hopeful expectation. But there is a side of political campaigning which on a minor level does Egypt a disservice, and a good example is visible right outside our home. Following the revolution Egypt was awash in patriotism and love of nation. It was a euphoric moment; up until this time the sense of Egypt-ness was a declining factor in personal identity and many yearned for the chance to live abroad. Suddenly, all was right with the world again. ‘Raise your head high, you’re an Egyptian!” was one of the most popular revolutionary chants. 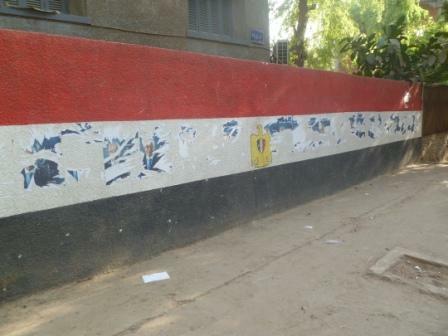 Our neighbors expressed their national pride by painting a several feet long Egyptian flag across their front wall. For months, even as the revolution (d)evolved into politics, the flag beaconed the new Egypt and made us smile when we left the house. Then one day, Salim al-Awa appeared. Rather, the picture of his spectacled face. Salim al-Awa is a prominent Islamist thinker. Before the revolution he generated controversy by intimating Copts were storing weapons in their churches and monasteries. He later retracted and claimed misstatement, but the suspicion/rumor/slander was widespread even without his contribution. It, among other factors, played a role in inciting the attack on and burning of churches in Imbaba from May of last year. Interestingly, al-Awa is also a proponent of inter-Islamic reconciliation between Sunnis and Shia. This has generated further controversy in Egypt, especially among Salafis who reject Shiism as ‘innovation’ if not outright heresy. These are anecdotes, and they are minor ones. They are fitting for a minor candidate who does not stand much chance in the elections. 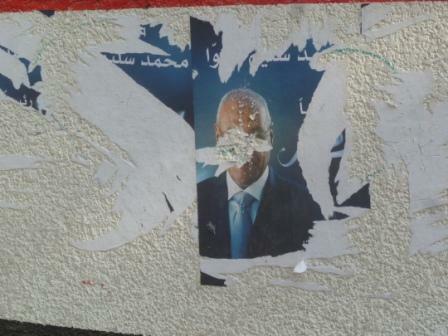 Even so, his posters are plastered everywhere, including the painted flag on our neighbor’s wall. Then one day not long after, nearly every poster was torn down. Unfortunately, the sticker-back left an even uglier scene behind. The defacing of candidate posters is almost as common as their ubiquity on walls across the country. In ancient Egypt, a disgraced Pharaoh would have his face removed from the hieroglyphics etched in his honor. After the revolution, a disgraced Mubarak had his name removed from schools, libraries, and the Cairo metro system. Now, the disgracing begins before a misstep is even made. Perhaps Salim al-Awa is a flawed candidate, but he deserves the courtesy of unimpeded candidacy. Yet his image, as those of other candidates, tends to last only a few days to a few weeks before someone disfigures it. Of course, it was his supporters who disfigured the Egyptian flag in the first place. Democracy at its best is a culture, not simply a system. While the values of culture may disintegrate – see similar examples from the West – they also take time to build. This does not lend credence to the cries of Mubarak’s officials that Egypt was not ‘ready for democracy’. It simply means that Egypt is undergoing a new experiment, as America did over two centuries ago, stumbling and bumbling along the way. As with all experiments, the outcome is unknown. This pertains not only to the choice of president, but the success, viability, and permanence of the new system. Perhaps this applies to American democracy as well. 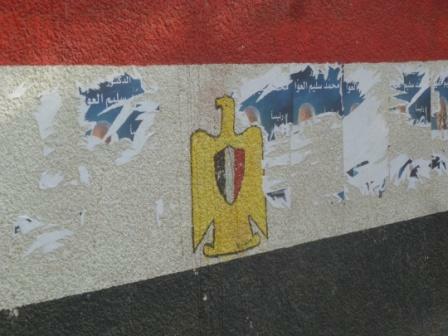 In the meanwhile, posters are torn, flags are covered, and Egypt… Egypt remains. She is among the unique nations of the world that has staying power beyond a system. Millennia of history engrain not only a culture, but a civilization. All the same, she can still be defaced. May conduct in these elections not leave a permanent scar. Note: This article was originally published at Aslan Media.